India's Zauba website, which lists products shipped into and out of India, might have revealed the sequels to the Samsung Galaxy A3 and Samsung Galaxy A5. The metal-clad smartphones were introduced last year as being perfect for social-media obsessed youth, with a 5MP front-facing camera that takes "vivid selfies" according to the manufacturer. One clue that the Zauba listing might be revealing the Galaxy A3 and Galaxy A5 sequels comes from the model numbers listed. The Galaxy A3 and Galaxy A5 were the SM-A300 and SM-A500, respectively. The two unnamed handsets listed on Zauba are the SM-A310F and the SM-510F. The last letter could be a country code. The listing also reveals that the SM-310F will feature a 4.75-inch screen, while the SM-510F will be equipped with a 5.2-inch screen. That would be a small bump in screen size from the 4.5-inch display on the Galaxy A3, and the 5-inch screen on the Galaxy A5. Considering that the latter two models were unveiled last year in late October, we wouldn't be surprised to see the sequels meet the light of day very soon. 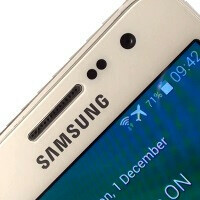 Sequels to the Samsung Galaxy A3 and Samsung Galaxy A5 appear on Zauba?